Welcome to The Abso!ute Sound online! We explore music and the reproduction of music in the home. We believe that the sound of music, unamplified, occurring in a real space is a philosophic absolute against which we may judge the performance of devices designed to reproduce music. Our goal is to provide the resources consumers need to judge how a component's sound either honors or departs from the music's truth, and to make sound purchasing decisions that maximize their experience of reproduced sound. 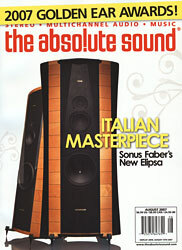 Below is our Issue 173, August 2007 contents and editorial. Robert Harley listens to the $595 Focal 706V loudspeaker and $900 B&W CM1. The Fatman brings tube amplification to the iPod. Chris Martens reports. Our editors and senior writers honor their favorite audio components. Wayne Garcia looks at a contender for the state-of-the-art in tonearms. Jonathan Valin on what may be the best moving coil yet. Good things come in these small packages from Belles, says Neil Gader. This marriage of German engineering and Chinese manufacturing deivers high value, says Chris Martens. Don’t call the CA200 an "integrated amplifier." Neil Gader tells you why you’ve been warned. Chris Martens reports on a complete music system from Scotland's venerable Linn Hi-Fi. What looks like the Luxor hotel and sounds as luxurious as it looks? Jacob Heilbrunn has your answer. Chris Martens on a variety of intriguing interconnects, speaker cables, and AC-conditioning products. A balanced, full-function preamplifier with 300B tubes? That would be your basic Audio Space Ref 2, says JV. Harry Pearson's 2007 Golden Ear Awards. 160 Why the lower case "c" and "j" in conrad-johnson? Neil Gader interviews c-j founder Lew Johnson and gets the answer.